Almost everyone is on social media these days. And based on studies, the average social media user or person has a total of five social media accounts and spends around 2-4 hours browsing these networks every day. Imagine that?! All thanks to the rise of mobile internet. This is why bloggers, designers, developers, marketers and website owners should take advantage of these powerful networks. Just imagine the amount of traffic you can gain from this huge sites! If you’re looking for social icons but don’t have time or money to spend for it, you’re in luck! Today, I just finished this free square themed social icons for my readers. I have here 4 different social icon set to choose from with a total of 49 icons on each pack. All well organised in .PSD file and can be change/edit as you wish. This is currently in version 1.0. So expect more new icons to be added on this list as we go along. I will update this from time to time and you can also suggest if I missed something. Also, it would be awesome if you can link to this social icon packs if ever you used it in your projects. This pack contains 49 border outline themed social icons in 64×64 pixels. Best for minimal websites and other minimal design projects. Comes with 49 solid square background of social icons. Change whatever color you like. 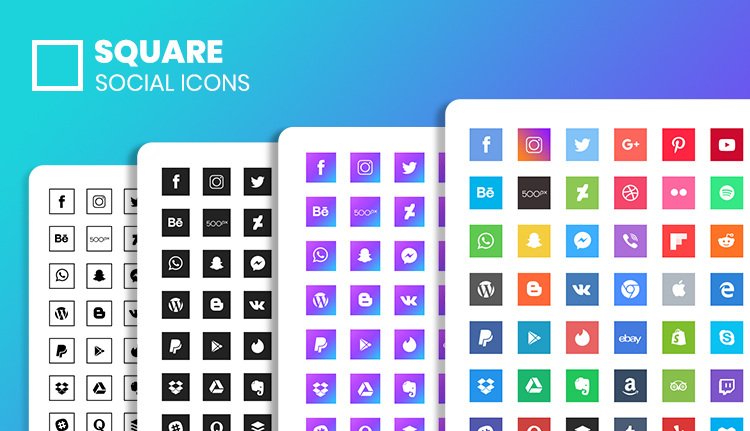 Gradient websites will suit on this social icon set. Composed of 49 gradient square icons made in photoshop. Contains 49 square social icons. It adds a fresher feel for your blog and creatives. Download this pack for free and use them to your projects. So that’s it for now. If you have suggestions or inclusion request of a social icon, feel free to post it in the comment section below so we can add it in the future. Have a blast downloading and updating those social media icons! Cool ! thank you for sharing. Keep up the good work. We searched for an hour to find a facebook icoon and thanks to you we got a great one!!! Thanks a lot we appreciate it!! Thanks for sharing these cool social icons sets was looking for it for my website that i’m designing and could not find it according to my liking but thanks to you now i found it and gonna try and experiment with it and see which one looks the best. Thanks a lot. Happy to know that this helps Daniel.